56. Oplontis. 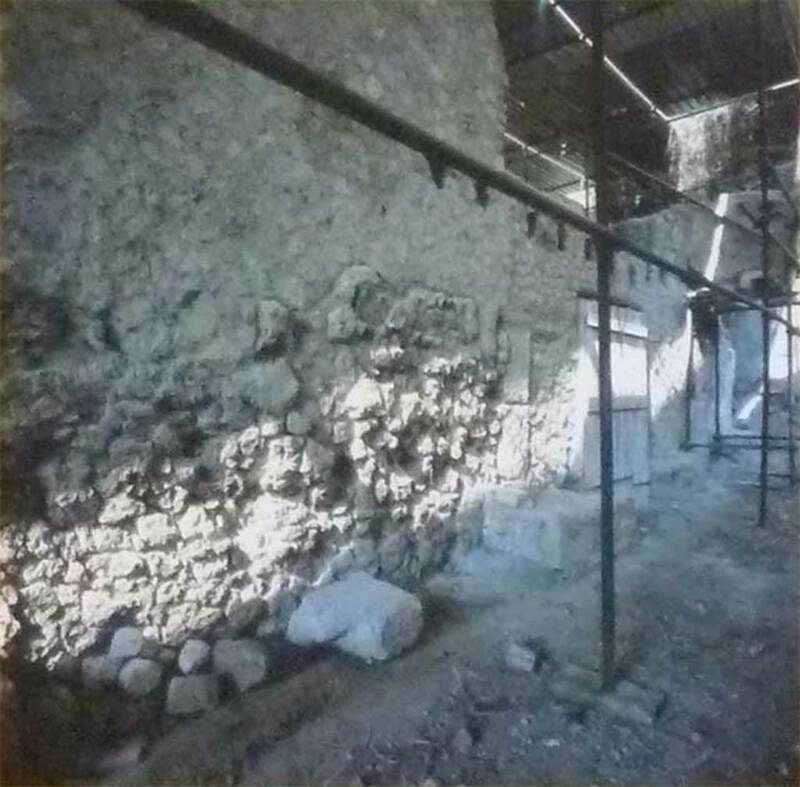 Villa rustica di Lucius Crassius Tertius. 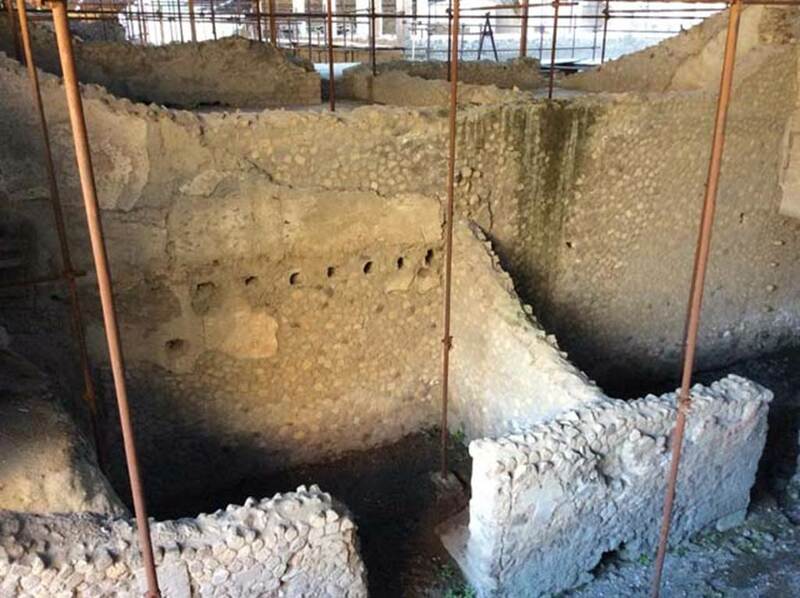 or Villa di L. Crasso Terzio, Oplonti or Oplontis Villa B.
Excavated 1974 to 1991, and also 2010 onwards by the Oplontis Project. Oplontis, Villa of Lucius Crassius Tertius. March 2005. 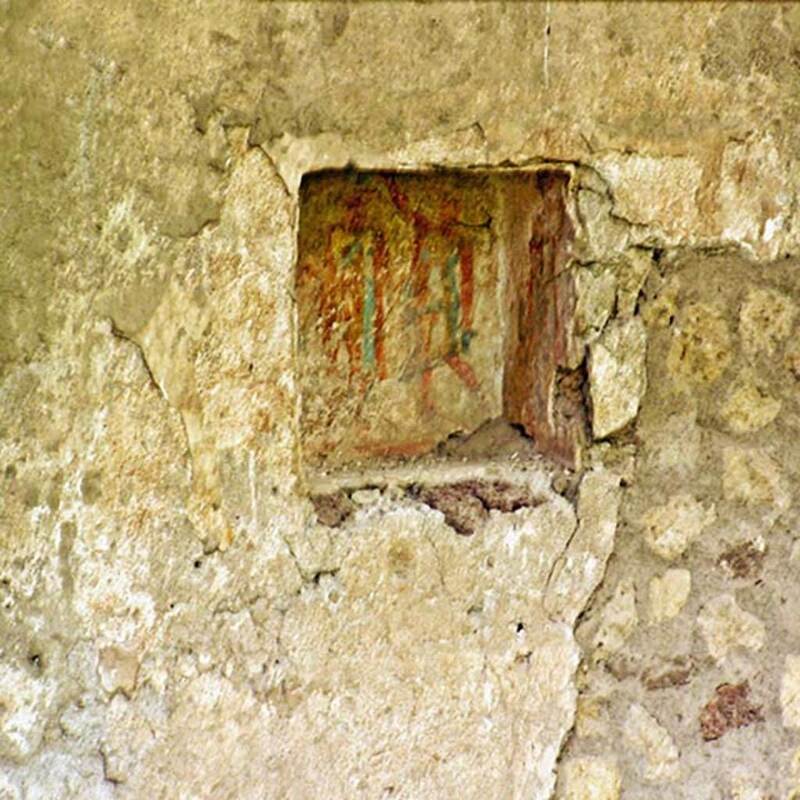 Remains of painted plaster. Photo courtesy of Massimo Gravili. Oplontis, Villa of Lucius Crassius Tertius. March 2005. Overhanging wall with temporary support. Oplontis, Villa of Lucius Crassius Tertius. March 2005. Rectangular lararium niche, with painting of two figures? Oplontis, Villa of Lucius Crassius Tertius. March 2005. Room on north side with niche and what appears to be two layers of painted decoration. Oplontis, Villa of Lucius Crassius Tertius. March 2005. Room on north side with niche. There appears to be two different layers of painted decoration. Oplontis, Villa of Lucius Crassius Tertius. March 2005. Looking west along south side area 44. Oplontis, Villa of Lucius Crassius Tertius. October 2017. Looking west along south side area 44, South Street. Photo courtesy of Bruce Longenecker. Oplontis, Villa of Lucius Crassius Tertius. March 2005. South side, room at east end. Oplontis, Villa of Lucius Crassius Tertius. March 2005. 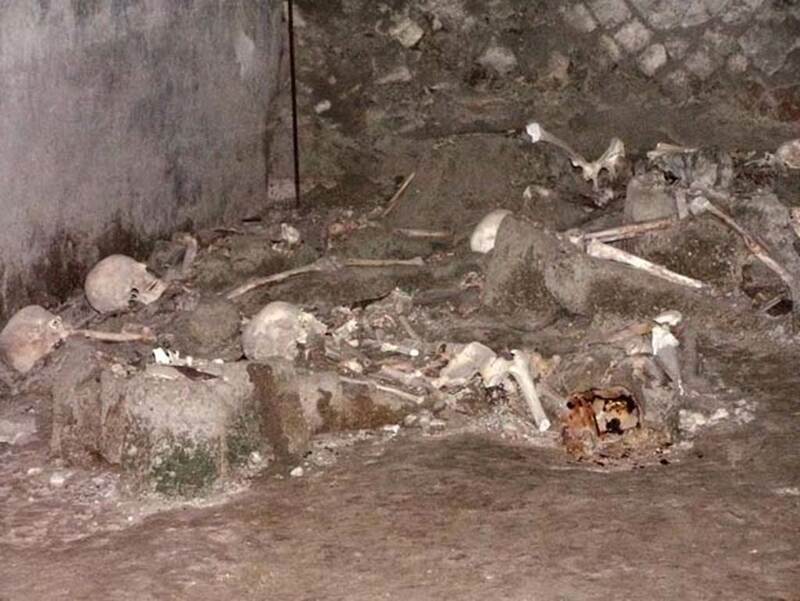 Remains of skeletons in room 10 on south side. Oplontis, Villa of Lucius Crassius Tertius. March 2005. East end of south side. Villa of L Crassius Tertius. May 2011. South side. Looking east along area 44 past rooms 42, 43, 8bis and 10. The south side is bounded by a street by which the products of the business would have been distributed. Oplontis, Villa of Lucius Crassius Tertius. March 2005. 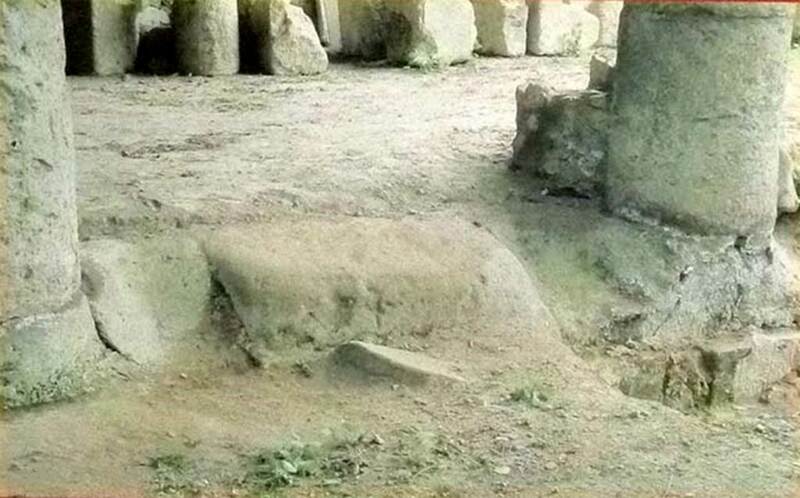 Remains of pilasters on south side. Oplontis, Villa of Lucius Crassius Tertius. March 2005. 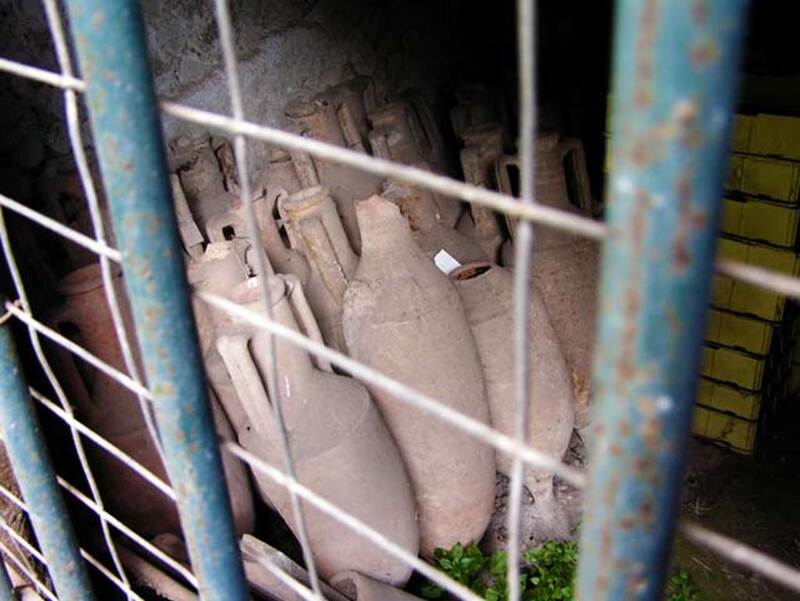 Excavated amphorae in storage. Villa of L Crassius Tertius. May 2011. North side bounded by a road. In the 1980s, beyond the road the presence of other edifices was identified, for the moment not explored. 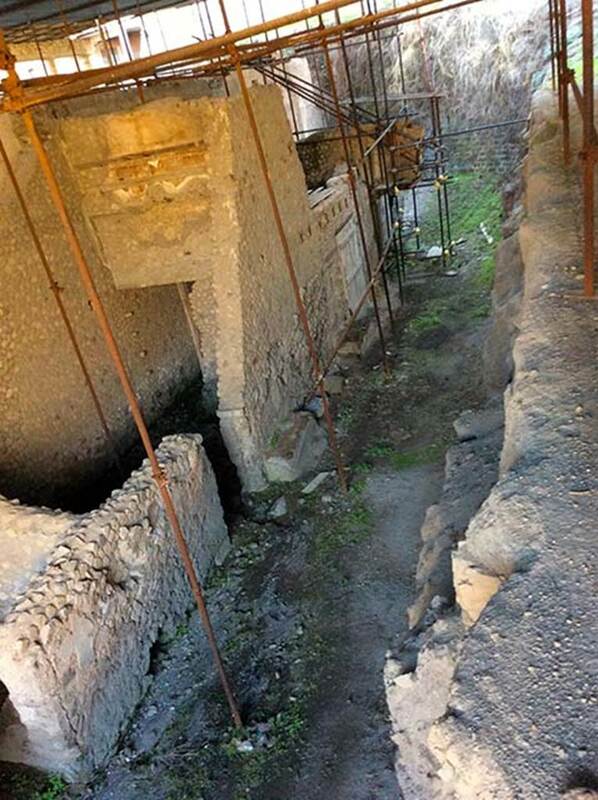 According to the Oplontis Project, along both sides of the road were simple town houses. These houses consisted of a ground floor room with beaten earth floor, and with the foundation for a staircase that gave access to a single upstairs room. 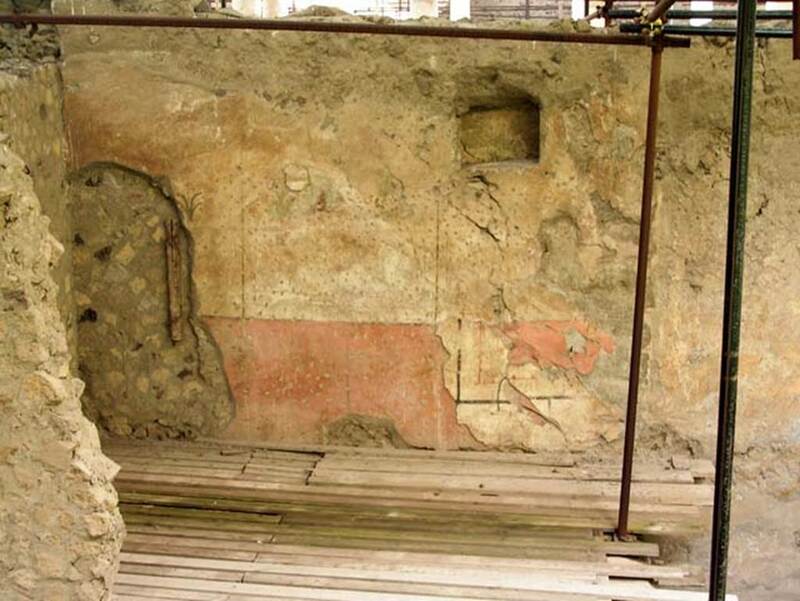 In their excavations [at room 47] they also identified a latrine. 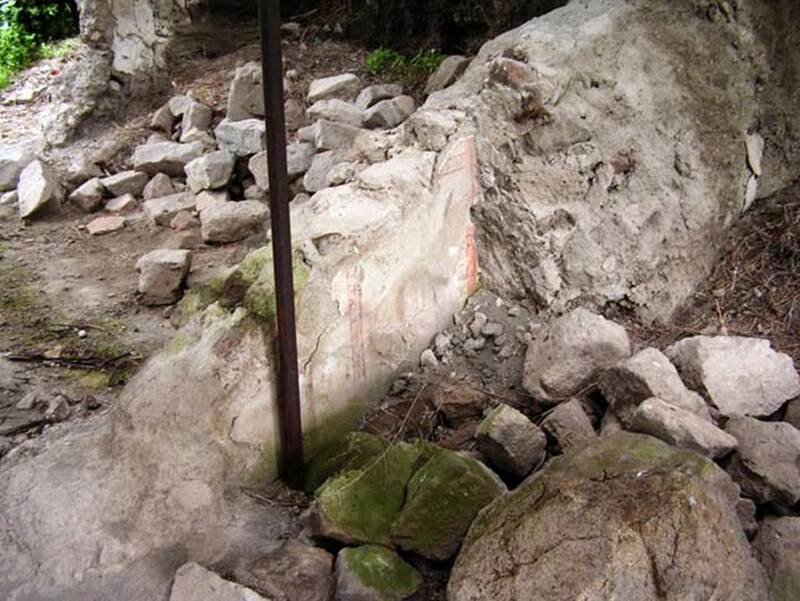 Their excavations in 2012-13 identified two phases of street construction. 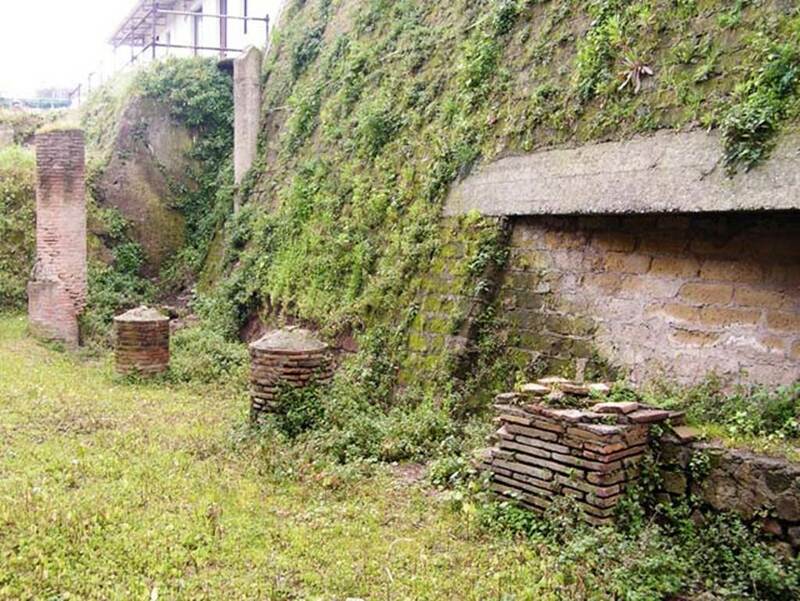 The earlier phase was of beaten earth and rough concrete. Cart ruts were clearly seen in the centre along with a possible small drainage conduit. 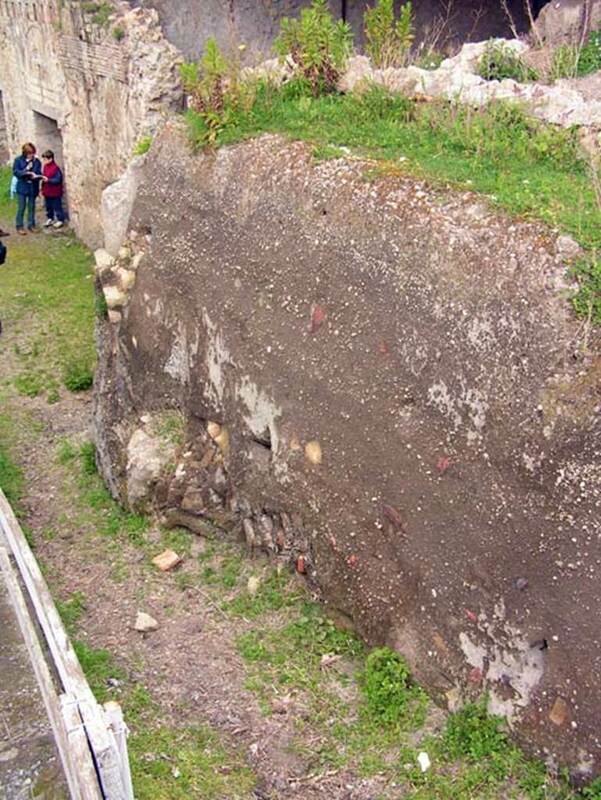 The second phase covered the first with an “acciottolato” (cobbled) pavement of beaten earth and pebbles. 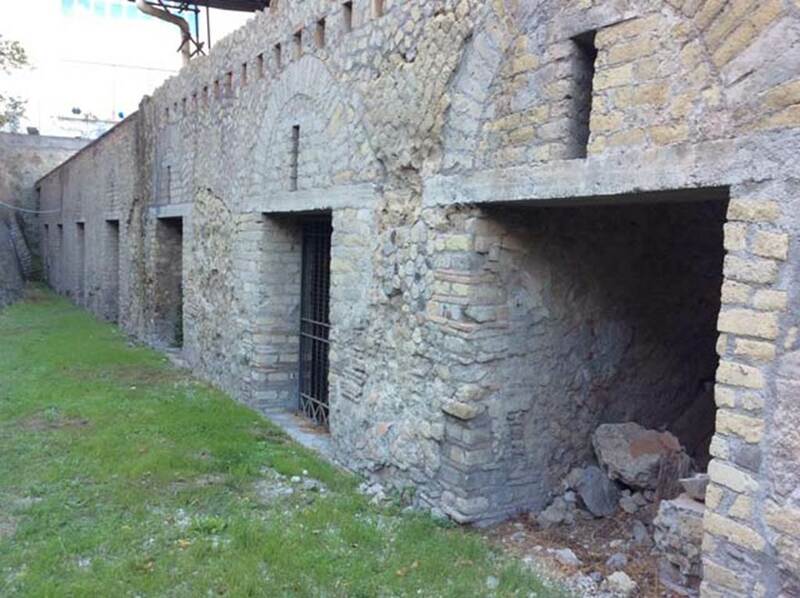 According to the Soprintendenza, sul lato nord dell'edificio sono emerse alcune piccole abitazioni a due piani, indipendenti dall'edificio e aperte su di una strada, che separa la villa da altre strutture edilizie presenti sul lato opposto. Potrebbe trattarsi di piccole botteghe, con annessa abitazione al piano superiore, e in tal caso la villa si presenterebbe inserita in una vera e propria insula, delimitata da strade: una situazione territoriale simile a quella di Stabia. 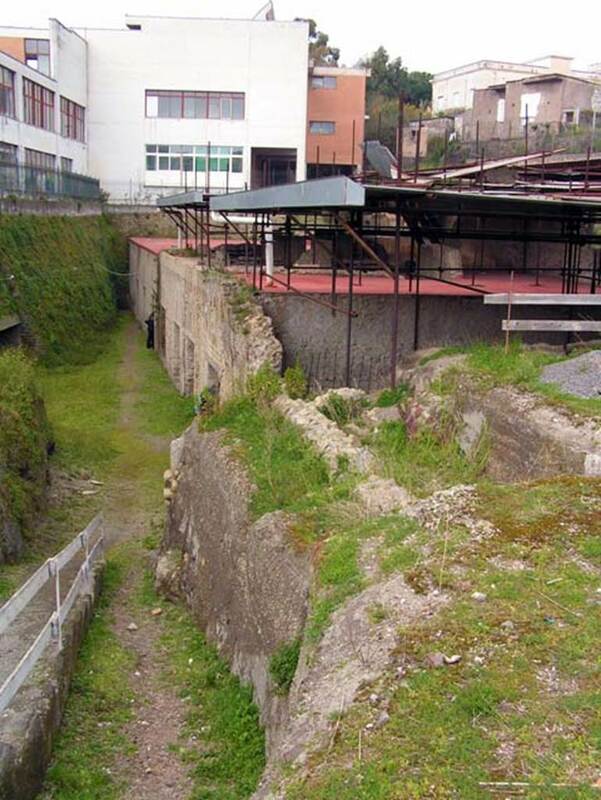 On the north side of the building, there were several small houses with two floors, independent from the building and opened on a road, which separates the villa from other buildings on the opposite side. It could be small shops, with an upstairs dwelling, in which case the villa would appear as part of a fully-fledged insula, bounded by streets: a territorial situation similar to that of Stabiae. Oplontis, Villa of Lucius Crassius Tertius. October 2017. Room 48 on north side. Oplontis, Villa of Lucius Crassius Tertius. October 2017. Room 46, on north side, on left. Looking west towards rooms 47 and 48. Photo courtesy of Bruce Longenecker. Oplontis, Villa of Lucius Crassius Tertius. October 2017. Rooms 35 and 46, on north side. Photo courtesy of Bruce Longenecker. Oplontis, Villa of Lucius Crassius Tertius. March 2005. Looking east. 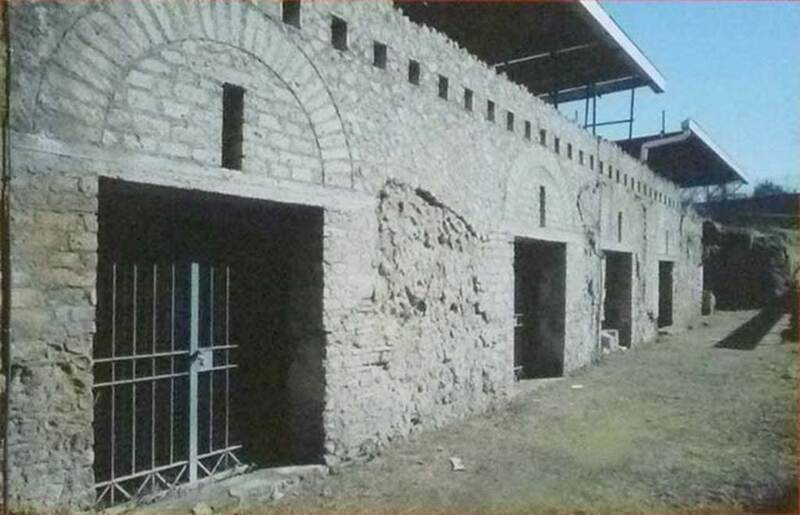 North side rooms 46, 35 and behind the higher wall room 29. Oplontis, Villa of Lucius Crassius Tertius. May 2011. Wheel ruts resulting from cart traffic. 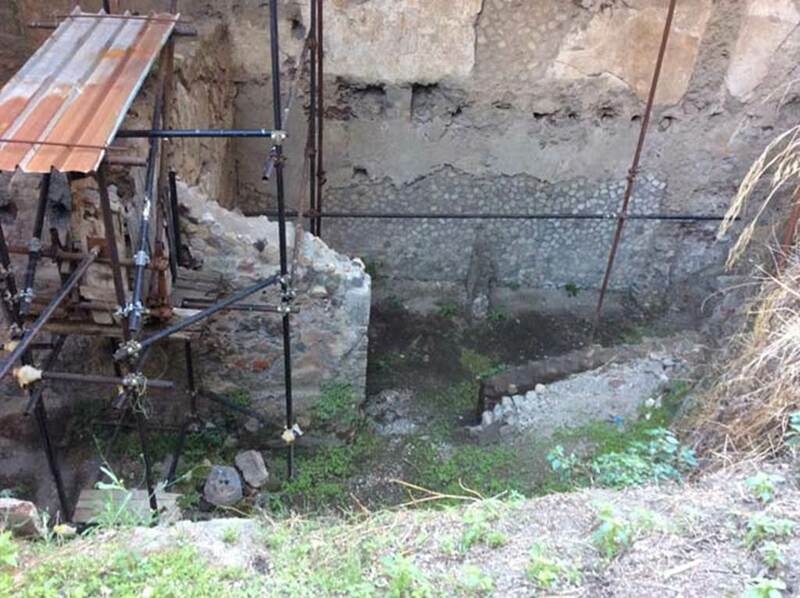 According to Ivo van der Graaff, there were wheel ruts all over the central courtyard, and some wheel ruts uncovered by the Oplontis Project in 2014 “were so distinct that their presence almost seems purposeful”. Oplontis, Villa of Lucius Crassius Tertius. May 2011. Stone stove or hearth. According to the Soprintendenza, i bracci del peristilio furono utilizzati come deposito di contenitori da trasporto: più di 400 anfore, in massima parte da vino, erano appoggiate ai muri, capovolte ed inserite l'una nell'altra. 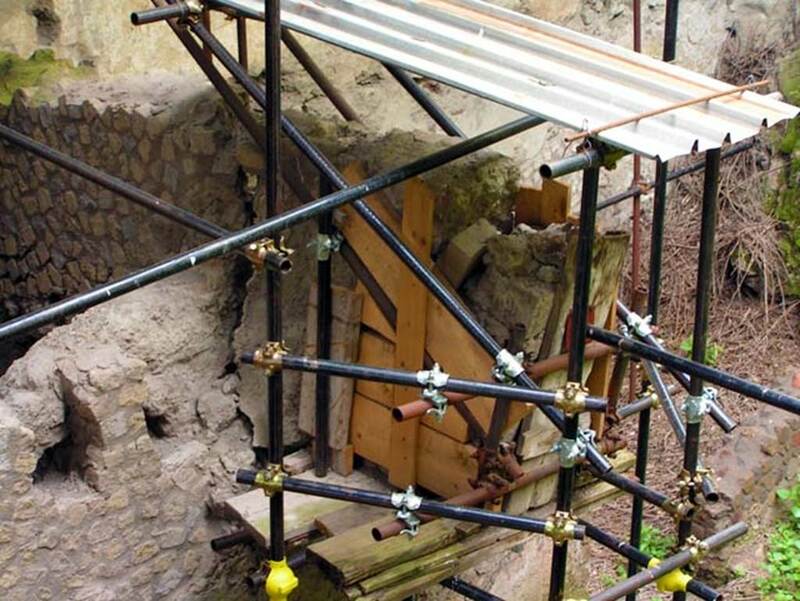 Questo dato, assieme al rinvenimento di un fornelletto in pietra sul quale era poggiata una pentola contenente resina di conifere (utilizzata come rivestimento della parete interna delle anfore), spiegherebbe la funzione dell'edificio, probabilmente un'azienda che si occupava della lavorazione di prodotti agricoli e dell'imbottigliamento e del commercio del vino, prodotto altrove, almeno a giudicare dalla mancanza, nella villa, dei torchi vinari e di altre apposite attrezzature. 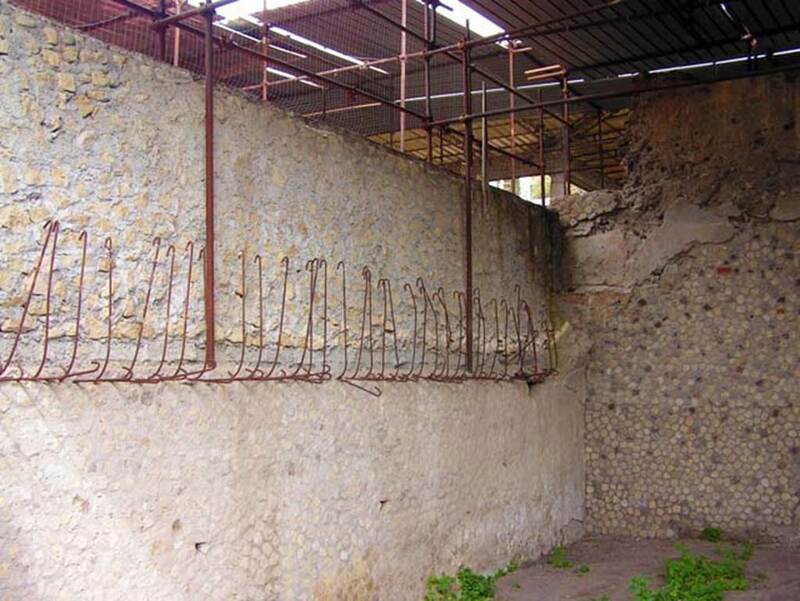 The arms of the peristyle were used as a storage depot for more than 400 amphorae, mostly used for wine, were leant against the walls, overturned and inserted into one another. 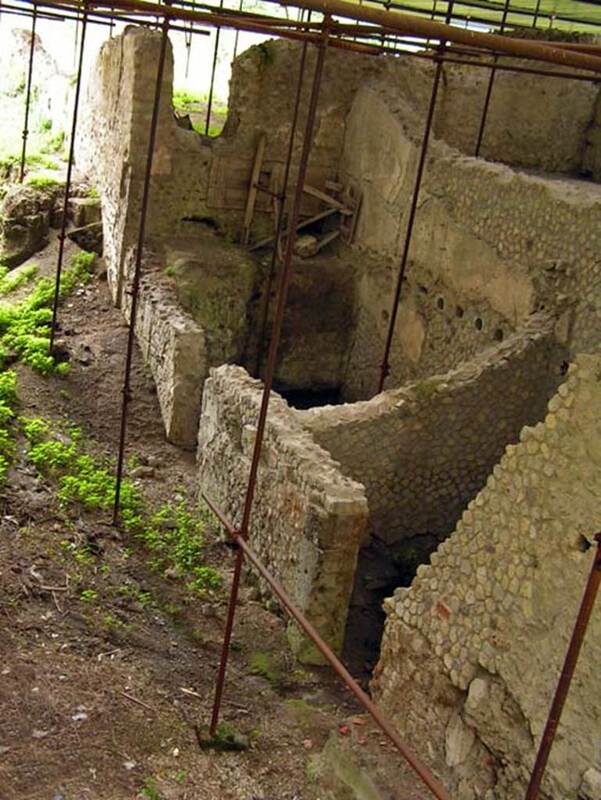 This, together with the discovery of a stone stove on which rested a pot containing conifer resin (used as coating on the inner walls of amphorae), explain the function of the building, probably a business involved in the processing of agricultural products and the bottling and sale of wine produced elsewhere, judging by the lack, in the villa, of the wine presses and other special equipment. Oplontis, Villa of Lucius Crassius Tertius. July 2010. 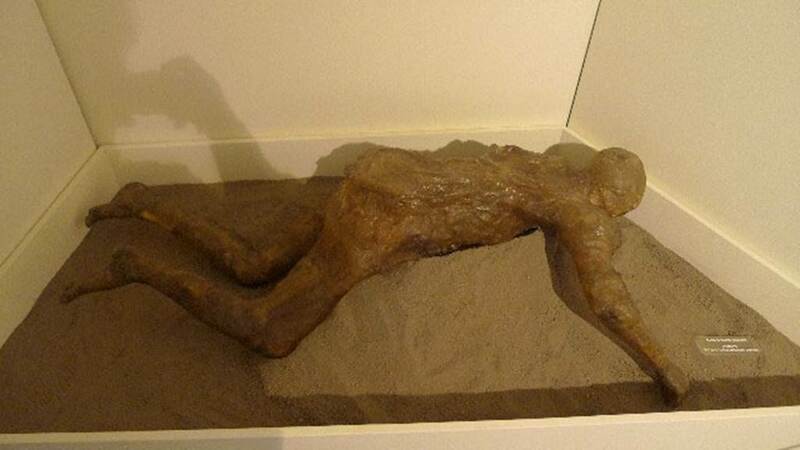 Resin cast of a woman found in 1984. 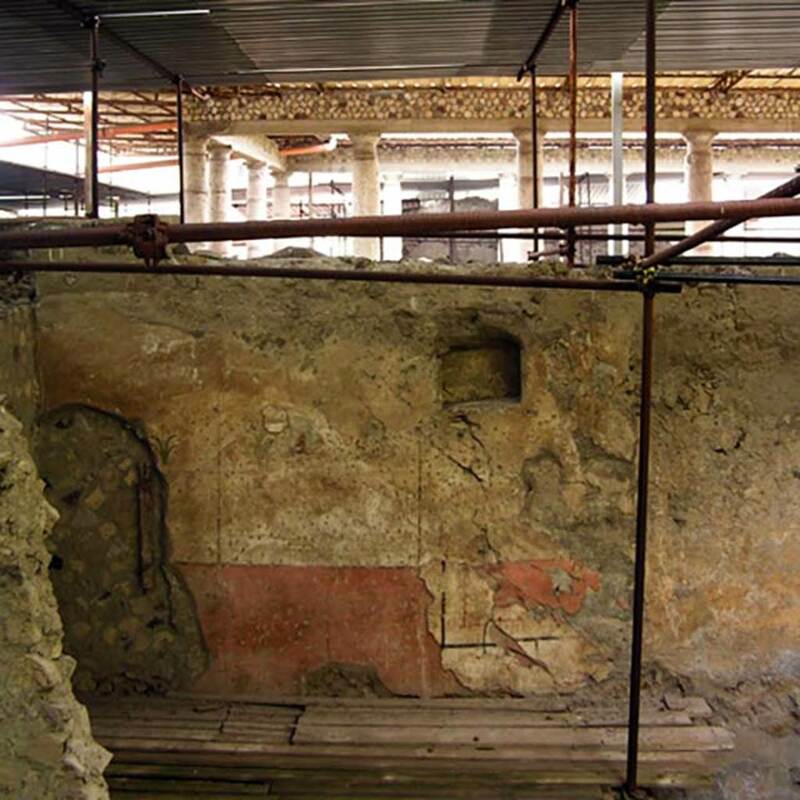 According to the Soprintendenza notice at Oplontis, this was a new technique using resin instead of plaster. 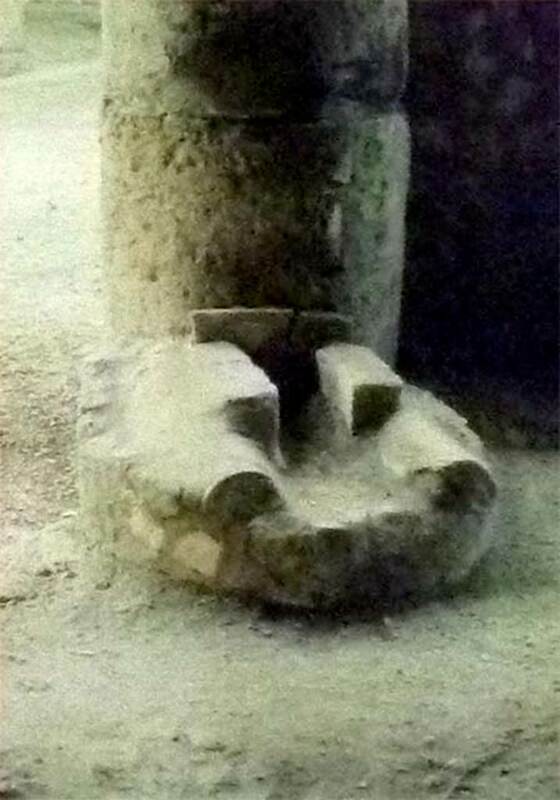 This gave a transparent result which allowed the bones, and the jewellery worn, to be seen. She was a young woman, adorned with armlet and gold earrings, affected by the poisonous fumes while she attempted to escape in a vain hope of salvation. See Malandrino, C., 1981, Sylva Mala II, p. 3-4.